Death Valley has always been on my list of places to visit (gotta get to all those National Parks), though, not on a short list, but I decided to visit recently, somewhat on a whim because I was starting a new job a whole week later than I anticipated. So a road trip was definitely in order! 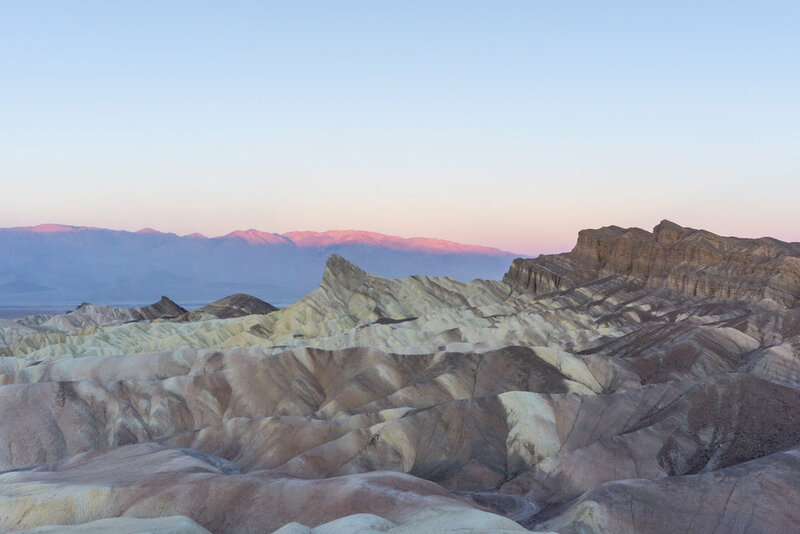 The moment I began driving into Death Valley I could tell this place was unlike anything I'd seen before. Plains of Joshua Trees framed by desolate mountains greeted me at the entrance, and I really had no idea how far the mountains would continue as I drove deeper into the park. First stop inside: get my campsite for the night. I opted for the Furnace Creek campground since it seemed to be the most centrally located of all the options. Good thing barely anyone visits Death Valley & it was a Monday! Plenty of spots available. After battling with the wind for a bit, I got my tent up (great practice for the PCT), ate a few snacks, and walked over to the visitor center which was basically next door to my campsite. I had to buy all of my National Parks things (cute postcard, sticker, patch) and get my passport stamp. And since there was no entrance station, show my America the Beautiful Pass to "get in". Somehow all of those things took forever, and I was already pushing sunset! 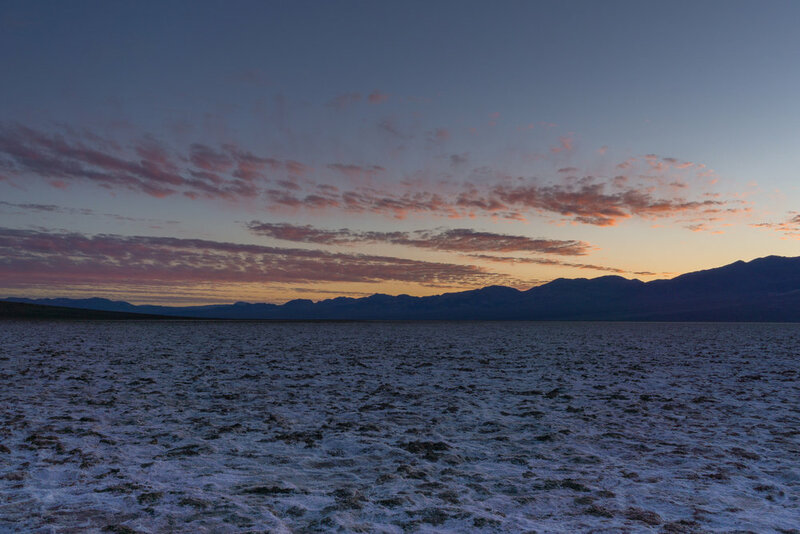 So I hopped back into the car and started inching my way to Badwater Basin for sunset. I originally wanted to hike Golden Canyon, but I was cutting it too close on time, so went straight to the Artist's Palette drive. The drive itself was so cool. You're basically driving through a little canyon - there are some tight spots between big rocks at times! 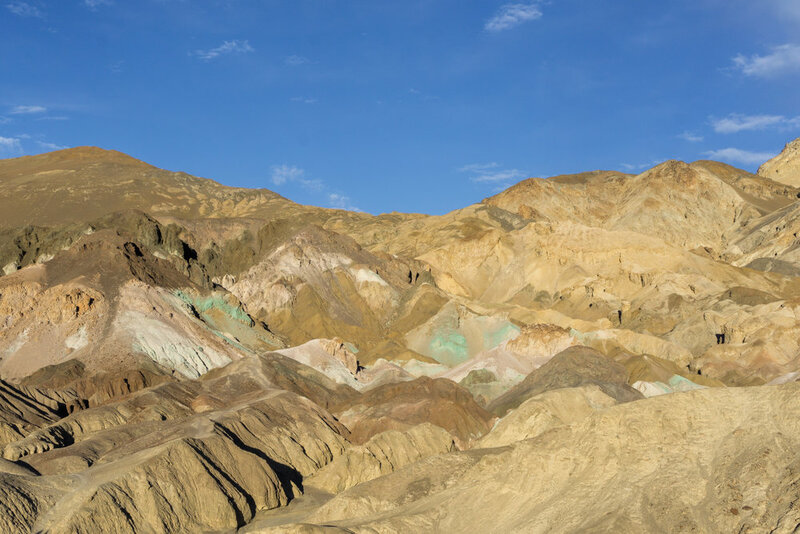 The colors at Artist's Palette were very awesome, but as I noticed later, definitely not unique to this exact spot in the park! It's crazy what natural chemicals in the Earth can do when exposed to certain elements. After a minute of solitude here, tons of people showed up, which was my cue to leave! I sped down the road towards Badwater, again skipping another destination (Devil's Golf Course) because the sun was really starting to set now - and I made it just in time! 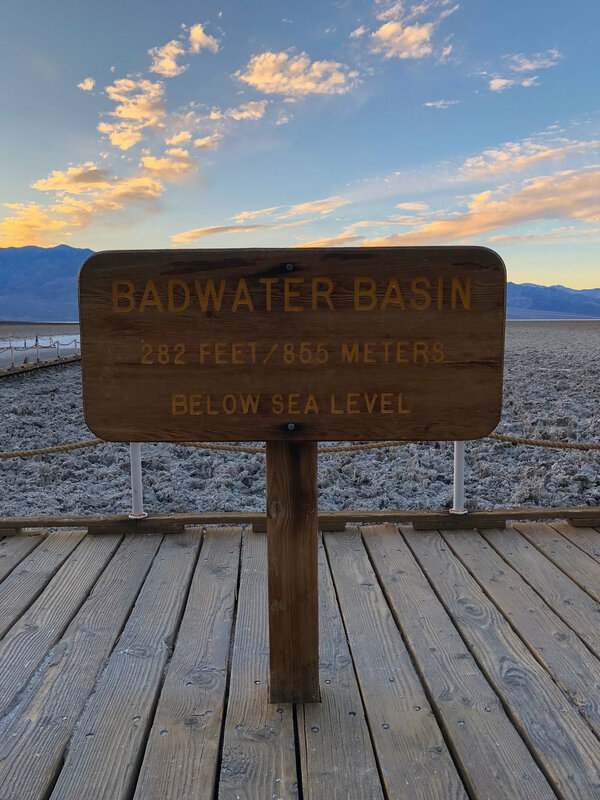 Badwater Basin is the lowest point on land in North America, and the lowest I've ever been on land/ in the ocean! The salts were so interesting. I didn't realize it would be so hard - they were more like rock crystals than sandy salt, and seemed engraved into the ground. And the patterns they made were super pretty. It was sad to see so many people disrespecting this area though - so many people had carved their initials/ random words & phrases into the salt - up to an inch deep in some places! 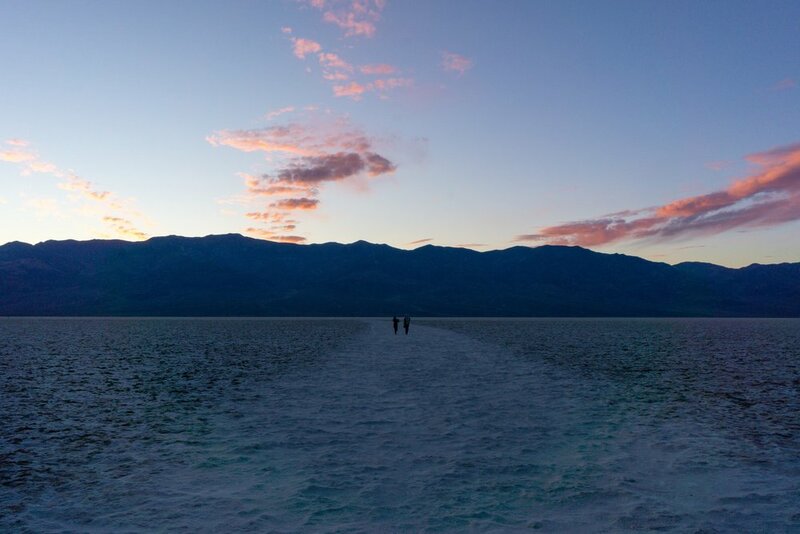 Another friendly reminder to Leave No Trace, and nobody cares that K <3's M.
The salt flats go on for miles, but I didn't make it too far out with the sun setting. Next time, I'll venture further out into them. After a super windy night's sleep (in which my new tent held up just fine! ), it was time to wake up... at 4:30 to get ready for sunrise. Waking up for sunrise is always so hard, but I promise it's worth waking up for almost every time! 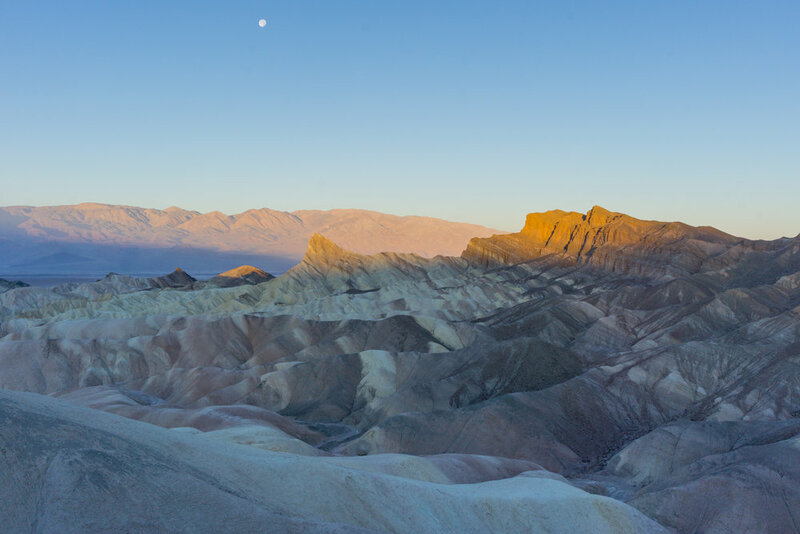 After eating my pre-breakfast in my sleeping bag, I hopped in my car and drove off to Zabriskie Point. It was soooo cold outside. The temperature was only in the 40s, but the wind was absolutely insane! My car was shaking as I sat in it, waiting for more light before setting up my camera. Photographing this area was crazy! I opted to follow the social trail to the area immediately below the concrete viewing platform. The sun seemed to take forever to rise. It was so beautiful, but also sooo windy - I couldn't take my hand off my tripod for more than 10 seconds without it getting blown over. But it was still quite a nice sight to behold. After the sunrise shoot, I hopped back into the car and drove to Dante's Point, at 5,475 ft above sea level. 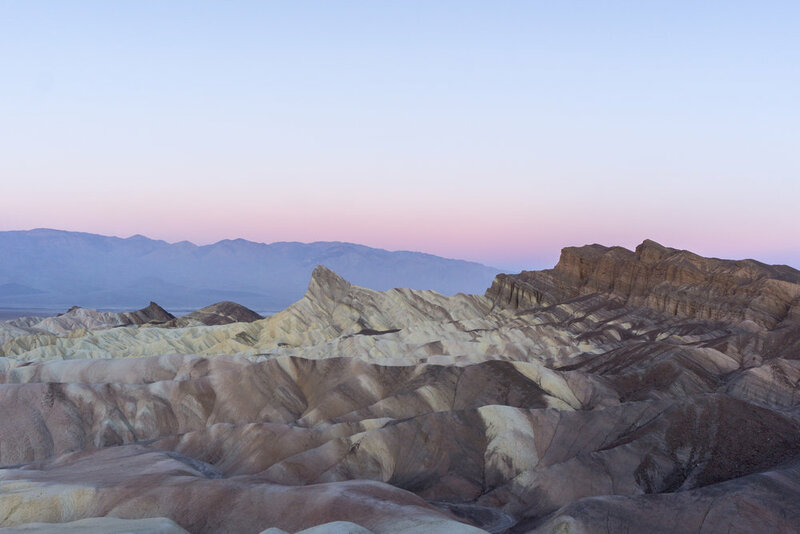 If I thought Zabriskie Point was cold, I didn't know what I was getting myself into. The temperature on my car progressively decreased as I drove up the windy road to the viewpoint. By the time I got there, it was 28F, not including wind chill. And it was even windier up there than Zabriskie! I mentally prepared for the cold and just grabbed my iPhone for some quick pictures. Seeing Badwater Basin from above was so insane! The scale is so hard to comprehend when you're standing down there, and is so amazing to see from above! I highly recommend making the detour out here - its incredible! I was so cold I barely even noticed all the other mountains around me. Done exploring for the morning, I drove back to the campground for a warm breakfast of oatmeal + nutella (such a great combo, BTW) and a mid-morning nap back in my tent to recover from the early wake-up call. It was considerably warmer at camp, down at -100 ft below sea level. I also had phone service at the campground, so I spent some time figuring out the rest of my day (including driving to Mammoth Lakes). I decided it was time to start heading out, despite the numerous other things I still wanted to see in the area. 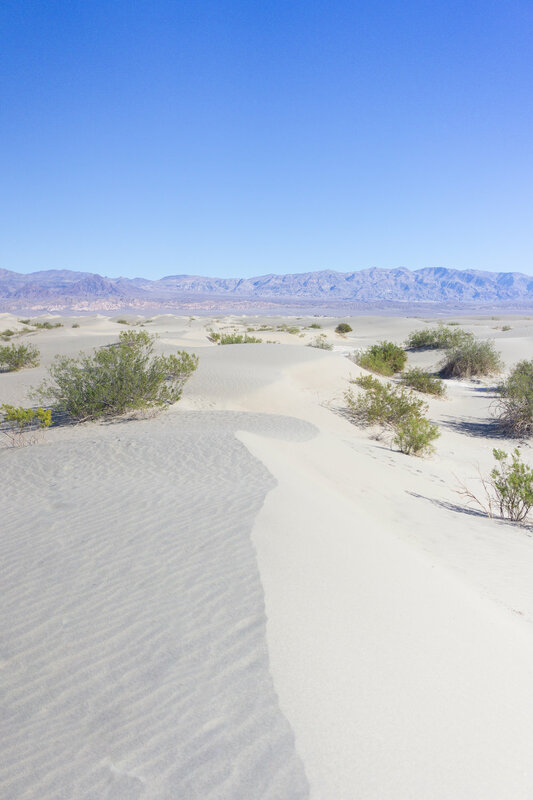 I packed up camp super quick, and drove straight for the Mesquite Flat Sand Dunes. Driving up to the sand dunes is so weird. There's nothing that resembles sand like this anywhere near the dunes - just a bunch of mountains and dirt and desert plants, and then all of the sudden there are these gigantic sand dunes in this one (relatively) little spot! I wandered a little ways into the sand dunes and started sweating! It was suddenly 70F where it was below freezing just a few hours prior! I'd definitely want to come here for golden hour/ sunset next time and come plenty early to get further out in the dunes where less people have walked. After enjoying the dunes, it was time to get back on the road. I mentioned it above, but the scale at Death Valley is just amazing. There are multiple tall mountain ranges within the park and huge, mostly flat valleys between them. 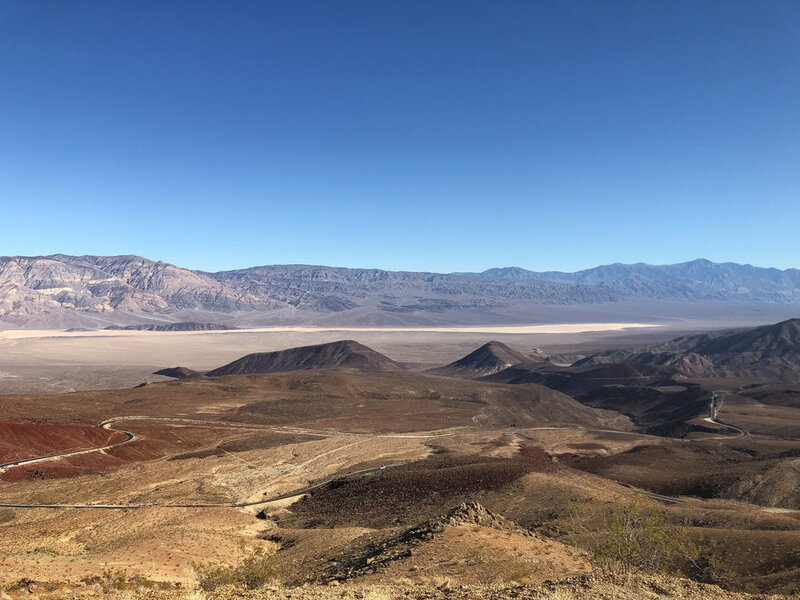 I thought Death Valley would be barren and desolate and flat, but it is so varied, and I didn't even see a tiny fraction of all it has to offer. My last stop in the park was the Father Crowley View Point. Another incredibly windy affair, I drove my car out on the dirt road almost the whole way to the final viewpoint. It was surreal looking at the distant mountains and knowing I was just photographing the backside of them (above pic) a few minutes earlier. And right as I was getting back into the car to leave, military airplanes came flying in out of nowhere practicing flying routes. It was so crazy to witness. And believe it or not, the planes were quiet compared to the howling of the wind. 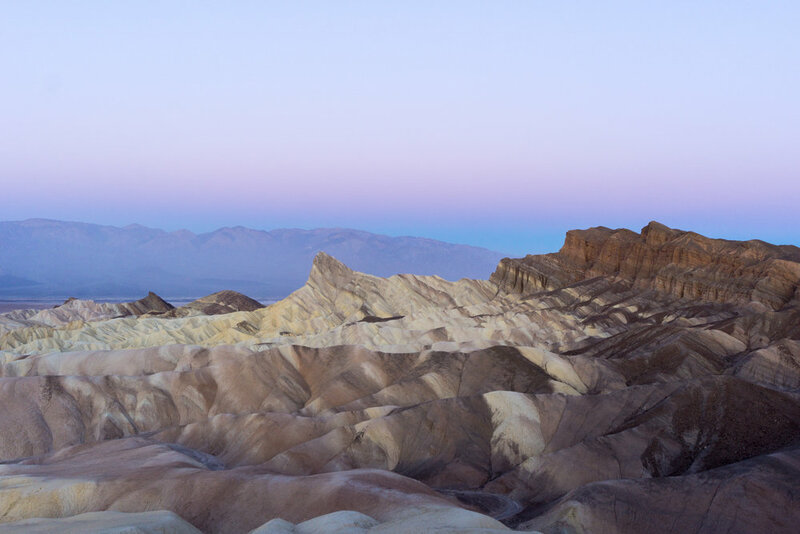 Death Valley is a sight to behold, and I can't wait to go back and explore more of the places I didn't get to see this trip and return to the places I did get to see. Preferably, I'll return in a car with 4WD so I can explore the backcountry dirt roads and get to spend more than 24 hours here! 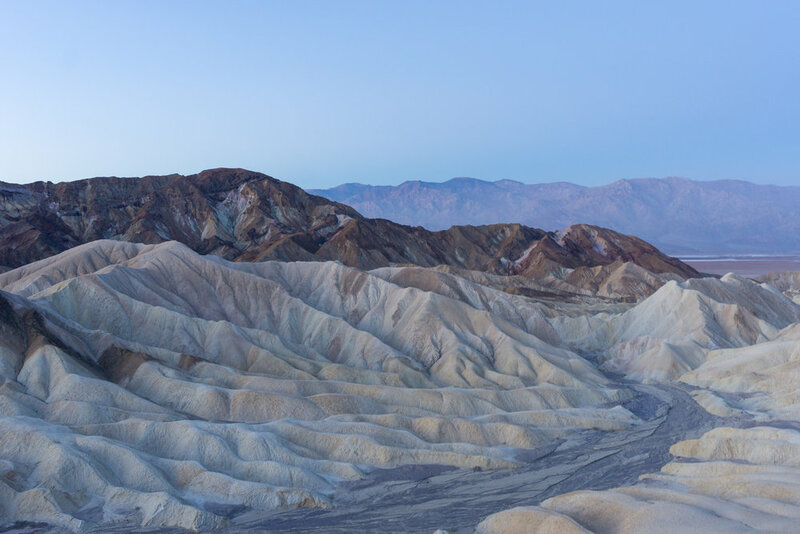 Have you been to Death Valley? What are your favorite places there?